There is a common refrain that it is not easy to be a Liberal Zionist these days. There was a time when Democrats and Liberals had a strong preference for Israelis over Palestinians in the ongoing 100-year conflict. 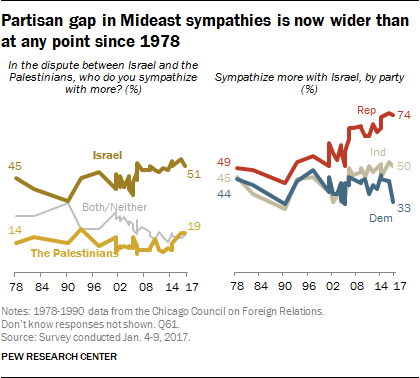 In 2002, Democrats sympathized more with Israelis than Palestinians by a margin of 45% to 21% while Liberals had a margin of 41% to 19%. Today, that gap has disappeared altogether. In the latest 2017 Pew Research poll, Democrats split evenly in their preferences between Israelis (33%), Palestinians (31%) and neither (35%). The Democratic leanings are in sharp contrast to Republicans who still favor Israel by 74% to 11%. It is a remarkable phenomenon considering that Israel is the most liberal country in the entire region for a thousand miles in any direction. This dynamic has become a struggle for Liberal Zionists who easily relate to their fellow Liberals on most matters, but not with 2/3rds of them when it comes to Israel. Elliot Cosgrove, the liberal rabbi of the Park Avenue Synagogue in New York City felt that he had to pen a piece about the situation. In the January 11, 2017 edition of The Jewish Week he wrote “For socially progressive Jews, it is an awkward time to be a Zionist — to be both liberal and a Zionist at one and the same time.” Why is this the case, what has been done and what can be done? There are arguably many reasons why liberals have moved away from supporting Israel. Here are two. Inequalities and the Size of the Conflict: A goal of many liberals is to bridge inequalities in society. The gaps may be between the haves and have-nots; between the rich and the poor; or between the powerful and the weak. Their desire is to flatten the field to cause the gaps to shrink or be virtually eliminated. When the left-wing looks at Israel, they see a fiscally-strong, military power occupying a poor Arab demilitarized population. The inequalities between the groups are enormous and the goal to “flatten” the dynamics strikes them as fair and appropriate. As such, they conclude that Israel must sacrifice so the Palestinian Arabs can have more. However, when many Zionists look at Israel, they see a dependable, democratic ally in the middle of unstable dictatorships. They admire a single, small Jewish State surrounded by dozens of hostile Arab and Muslim countries. Both views are true, and two liberal Zionists can arrive at different conclusions: either looking at the situation very narrowly as an Israeli-Palestinian Arab conflict, or more broadly as a conflict between Israel and the Arab World. A liberal approach based on the second perspective would argue for Israel ceding no land as it is the more vulnerable entity in the region, while the former approach adopted by many liberals today, pushes for Israel to hand over all disputed land to be a new state of Palestine. Multi-Culturalism and Relevancy: Liberals advance a cause of universalism over particularism. They see the underpinnings of a strong society as one that advances a multi-cultural and multi-ethnic existence over one that is more insular and monolithic. 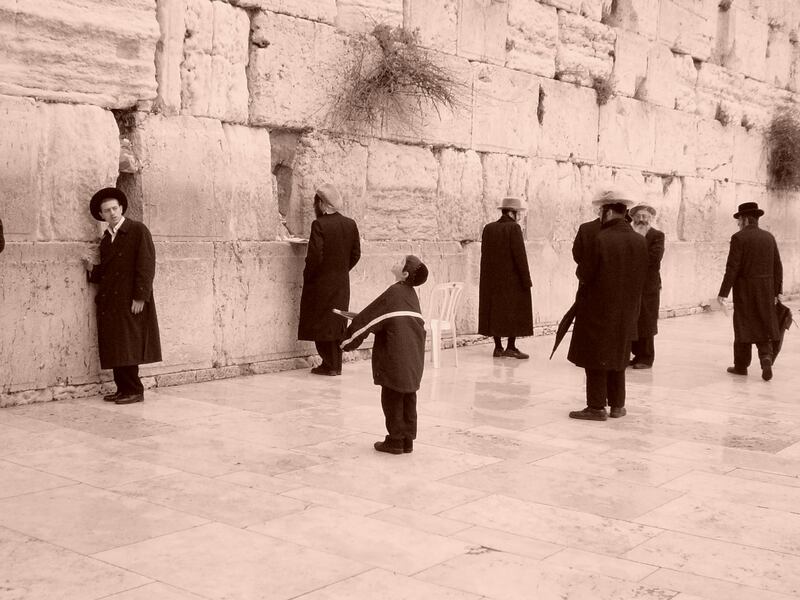 Consequently, many liberals see the idea of a Jewish State as backwards thinking, as the essence of tribalism. They therefore consider any association with such an entity as an embarrassment that would insult their liberal principles. These liberal Zionists support groups like the New Israel Fund and Adalah that seek to replace the Jewish State with a multi-cultural, multi-ethnic society. Other liberal Zionists see the thriving multi-cultural, multi-ethnic society that Israel has become, even as a Jewish State. 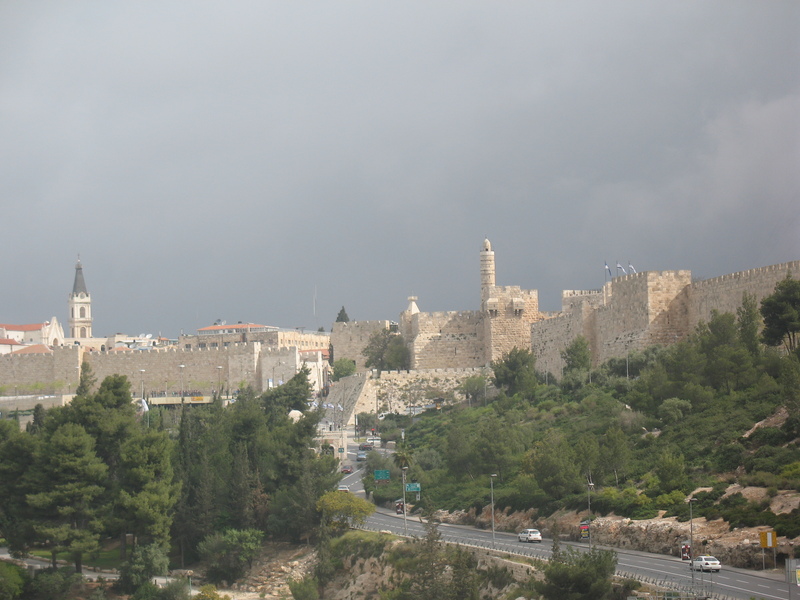 The Jewish Mizrachi community is the largest in Israel, and includes people from Morocco, Tunisia and Egypt. Thousands of Israeli Jews from Ethiopia, Yemen and Iraq have little in common with other Israeli Jews from Russia, Argentina and Poland. More so, roughly 25% of Israeli citizens are not Jewish, leading Israel to be the most ethnically diverse population in the MENA region. To accommodate the wide range of opinions, liberal Zionists have stretched the definition of a “Zionist.” In liberal circles, a self-described Zionist can be pro-BDS, as they fight for Palestinian Arab equality. A Liberal Zionist can donate to organizations that seek to undermine the Jewish character of Israel, as an expression of loving the modern thriving democracy. In contorting the bounds of Zionism, they have enabled themselves to sit comfortably with other two-thirds of “progressives” with whom they respect. For traditional Zionists, this situation is an absurdity. Imagine someone at a pro-choice rally with a large placard that argues for banning abortions after a fetus has a heartbeat at eight weeks, claiming that they are pro-choice because they are in favor of permitting the procedure in the first weeks of pregnancy. Many fellow pro-choicers might ask that person to move to the other side of the picket line to join the pro-life camp. They might negate the person’s self-declared status as “pro-choice” as they consider their actual position stands against the passionate tenets of the majority. No individual needs to subscribe to an entire platform of a group. For example, a Democrat might agree with the party line on global warming, but disagree on tax policy. A Republican could agree with the party position on foreign affairs, but disagree on social issues. In dealing with conflict, some people stay within their registered parties while they disagree on many issues, while others leave the party to become Independents. Single issue matters are more cut-and-dry. Someone may be in favor of gun control or against it. However, even within those binary choices, there is a range of opinion. For example, being against gun control doesn’t mean being in favor of getting rid of background checks or gun licenses. A single issue is still dynamic within itself. Liberal Zionists are subset of two groups: Liberals and Zionists. Liberals cover a broad range of issues similar to Democrats and Republicans. As reviewed in many polls, Liberals are not sympathetic to Israel. But that doesn’t mean that there aren’t Liberal Zionists that break with the majority. 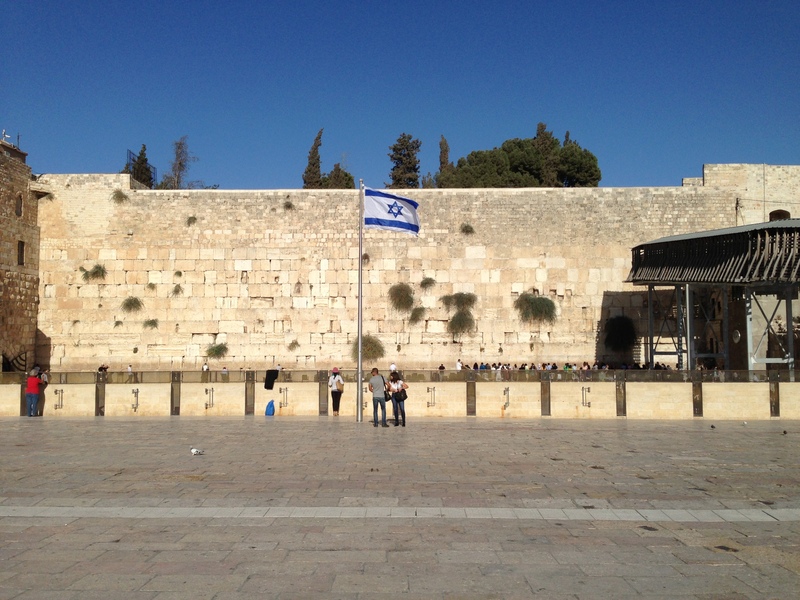 Israel is a single issue matter for Americans and more easily broken into binary choices. However, there is still nuance in the pro-Zionist camp, especially within the Liberal Zionist community. Rabbi Cosgrove noted that it is hard to be both a Liberal and a Zionist today. That is a sentiment that is rooted in someone that defines themselves as a Liberal first and a Zionist second. Zionists have no issues with Liberals, and Israelis are, by-and-large, liberal. Most Israelis and Zionists just believe in the essential nature of the country as a Jewish State and the critical need for security. For Liberals, being a Zionist is a bit harder to swallow. It typically means running against the majority opinion of the group with which one has chosen to identify. To reconcile that struggle, liberals either counter the ambivalence or anti-Israel sentiment of the group, or redefine Zionism in a manner that accommodates either liberal or Zionistic preferences. Many have chosen the latter, and twisted the definition of “Zionist” into something that is unrecognizable to the majority of Zionists. An easy way to be a Liberal Zionist is to use a wide lens when looking at Israel from a security standpoint within the broader Arab world, and narrowly when examining Israeli society from a social vantage point. Such an approach would be consistent with the majority of Liberal regarding daily life and with the majority of Zionists regarding daily existence. This entry was posted in Israel and tagged Israel, liberals, liberals and conservatives, Zionism by First.One.Through. Bookmark the permalink. “Liberals” are no longer liberal. The word has a plain meaning. Today’s left doesn’t fit that meaning. They side with repressive regimes around the world including against Israel, they repress free speech, they cannot even discuss opposing ideas, and they are reduced to hysteria and meltdown when there positions or candidates lose. The are the illiberal, intolerant, repressive Left.